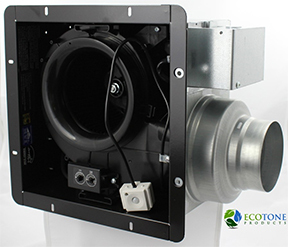 Ecotone Products Now Stocks and Distributes Advanced Panasonic WhisperGreen Ventilation Fans. Ecotone Products is now distributing green building standards complying Panansonic WhisperGreenTM ventilation fans. These fans are made to be installed in residential bathrooms and are built to continuously operate at a low adjustable cubic foot per minute (CFM) rate 24/7. This feature supports a continuous supply of fresh air in residential homes while exhausting stale or contaminated air to the exterior of the home. “Property managers and housing authorities are often confronted with mold and mildew situations in apartment complexes. Some apartments simply do not get a sufficient supply of fresh air. Mold and mildew can be caused by overpopulated apartments, individual lifestyle choices by tenants or simply by poor building design”, states Crystal Zeigler, account manager with Ecotone Products. Existing bathroom fans often run less than the recommended 30 minutes after taking a shower or bath. This causes the apartment to be exposed to elevated levels of humidity allowing for the onset of mold or mildew. The continuously running Panasonic WhisperGreenTM fans offer an easy and cost-effective retrofit option to combat poor indoor air quality. The most common Panasonic WhisperGreenTM models, Panasonic FV-08VKM3 and Panasonic FV-13VKM3, can be adjusted to run at two speeds: one lower adjustable speed that provides an ongoing fresh air supply (30-110 CFM) and one higher adjustable speed (80-130 CFM) that kicks the ventilation fan into high gear when the bathroom is in use. Humidity, stale and contaminated air is removed from the living environment, thus supporting improved levels of indoor air quality. Another feature that makes retrofitting apartments and homes with this technology easy is the use of a smart motion sensor that is included with the Panasonic FV-08VKM3 and Panasonic FV-13VKM3 ventilation fans. Having a motion sensor in place allows for the fan to be installed without a wall switch. Instead it can be hard wired and run entirely automatically. The motion sensor acts as a trigger to kick the Panasonic WhisperGreenTM into high speed while the bathroom is occupied allowing for odors or humidity to be removed quickly. An adjustable delay timer that is built into these fans allows for the high operating speed to drop back to the low continuous running speed after a certain amount of time. The delay timer used in the Panasonic FV-08VKM3 and Panasonic FV-13VKM3 ventilation fans can be adjusted to continue to run the fan at high speeds for between 30 seconds and 60 minutes after the occupant exits the bathroom. Most apartment managers adjust the timer to run for 30-60 minutes to maximize the removal of humidity from the environment. Ecotone Products carries a wide selection of Panasonic ventilation fans in stock. Factory trained Ecotone Products staff is available discuss your Panasonic ventilation fan needs via email and phone Monday through Friday, 7AM-5PM PST.